Latina women are less likely to utilize cancer screening services than are non-Latina White women. The purpose of this study is to examine the relationship between preferred language (English vs. Spanish) and receipt of mammography and Pap-smear testing among US Latinas and non-Latinas. Cross-sectional analysis of the 2008 and 2010 Behavioral Risk Factor Surveillance System (BRFSS) surveys. While Latinas responding to the BRFSS in English or in Spanish had unadjusted lower odds of receiving mammography testing, in multivariable analysis Latinas responding-in-Spanish had 2.20 times the odds (OR = 2.20, 95 % CI, 1.90–2.55) of reporting mammography compared to non-Latinas. Similarly, Latinas responding-in- Spanish had lower unadjusted odds of receiving Pap-smear testing. However, Latinas responding-in-Spanish had 2.37 times the odds (OR = 2.37 CI, 2.04–2.75) of reporting having received Pap smear testing compared to non-Latinas in multivariate analysis. 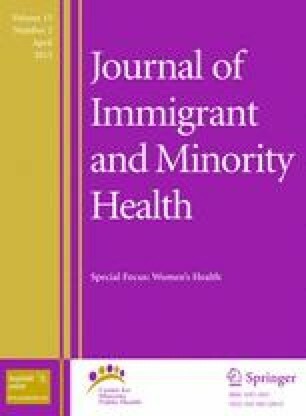 The results of this paper further confirm the “reversed associations” among Latinas and mammography and Pap smear testing described in previous studies and suggest that in addition to insurance status, preferred language may be a key variable contributing to the reversal phenomenon observed among Latinas. ACS. Cancer facts & figures 2012. 2012; Available from: http://www.cancer.org/acs/groups/content/@epidemiologysurveilance/documents/document/acspc-031941.pdf. Cited 10 Feb 2012. ACS. Cancer facts & figures for hispanics/latinos 2009–2011. 2009; Available from: http://www.cancer.org/acs/groups/content/@nho/documents/document/ffhispanicslatinos20092011.pdf. Cited 21 Feb 2012. USPSTF. Screening for breast cancer. 2009. Available from: http://www.uspreventiveservicestaskforce.org/uspstf/uspsbrca.htm. Cited 21 Feb 2012. USPSTF. Screening for cervical cancer. 2003. Available from: http://www.uspreventiveservicestaskforce.org/uspstf/uspscerv.htm. Cited 21 Feb 2012. US, Census, Bureau. Overview of race and hispanic origin, 2010. 2010. Available from: http://www.census.gov/prod/cen2010/briefs/c2010br-02.pdf. Cited 21 Feb 2012. CDC. Behavioral risk factor surveillance system 2010 technical information and data. 2010. Available from: http://www.cdc.gov/brfss/technical_infodata/surveydata/2008.htm. Cited 21 Feb 2012. US, Census, Bureau. 2007 Economic Census: Regions and Divisions. 2007. Available from: http://www.census.gov/econ/census07/www/geography/regions_and_divisions.html. Cited 21 Feb 2012. CDC. National Breast and Cervical Cancer Early Detection Program (NBCCEDP). 2009. Available from: http://www.cdc.gov/cancer/NBCCEDP/about.htm. Cited 21 Feb 2012.